I was here in 2012 and although the tsunami happened in 2004, so 8 years before, you could still see the damage at some places. The country is recovering, but be prepared for heartbreaking stories and destroyed places especially on the coast in the south. We landed in Colombo, but we asked our taxi driver to bring us immediately to Kandy, the second largest city of Sri Lanka in the center of the country. This city is surrounded with greens, lush jungles and tea plantations (actually the whole country is full of tea plantations…). Temple of the Tooth (Sri Dalada Maligawa): This temple is one of the most sacred Buddhist temples in the world. Each day thousands of Buddhists come here, because the tooth of Buddha is preserved here. The temple is decorated with great pomp and splendor. Around the building there is a big moat to protect the temple. During the night, there are several dance- and music performances. The biggest Buddha statue (Bahiravokada Vihara) of Sri Lanka is built on top of the mountain in Kandy and gives you a spectacular view over the city. Take a tuk-tuk or walk up there and just enjoy the views. On our first night, we went to see a local dance performance. You can’t compare it at all with our sort of dance and after a while it gets really boring because you don’t get the meaning behind the dance, but it was a very nice experience. Kandy Lake: The big lake in the middle of city is situated next to the temple of the tooth. There are perfect spots to take pictures and it is a quite relaxing place in the crowded city. Visit a small spice garden, called Susantha Spice Garden. On our way to the (elephant company) we stopped at a small spice garden. A local guy showed us around and thought us a lot about the different spices in the garden. When we stayed in Kandy we read something about visiting elephants. Most of the tourists go to Pinnawala, but we’ve also read some horrible stories about that one, so we decided not to go there. Instead we went to a smaller company, called Millennium Elephant Foundation, that keeps the elderly animals that were rejected from the group. It was a nice experience, but now a few years later I have mixed feeling about my visit to that place. Although they treated them with respect, they we still held captive… and that is not really the way to go. We also made the mistake of riding on the elephant (luckily without a basket and only for 10 minutes). Something we would never do again. To get around the country we decided to just take the local busses and for us that worked perfectly. It is very cheap, but it goes pretty slow… nevertheless you have to time to relax a bit enjoy all the beauty of this country along the way. After a trip of almost 4 hours we arrived ad Anuradhapura, a place in the north of Sri Lanka and it is on the World Heritage List. It used to be the capital city and is known for the ruins of Stoepa’s (typical Buddhist buildings), temples and other historical building. Now it is a holy city for the Sri Lankans. Anuradhapura is big, so don’t make the mistake to go by foot. Take a tuktuk or rent a bike, just like we did. We enjoyed this place a lot and we would recommend it to everyone that wants to go to Sri Lanka. Sigiriya is a village in the cultural triangle of Sri Lanka and was one of my favorite places in the country. 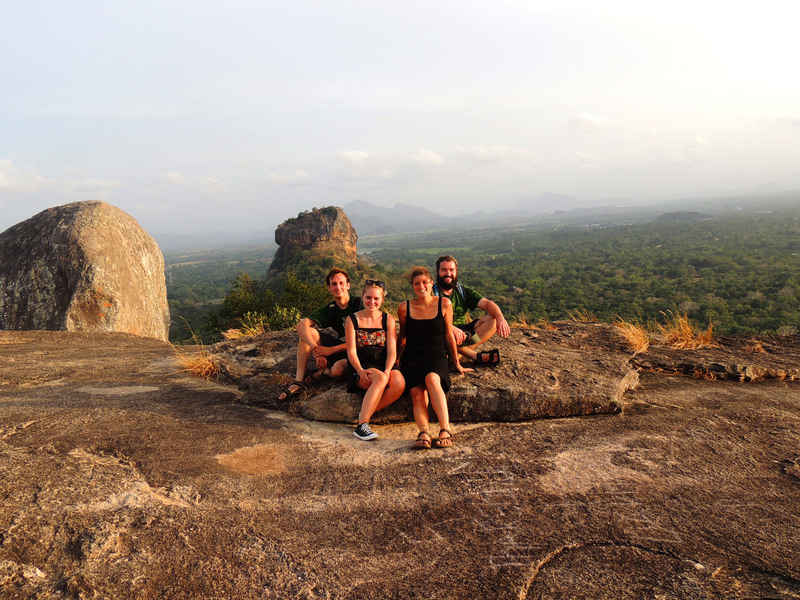 The highlight here is the Sigiriya rock, also known as the lion rock. We stayed in a local guesthouse and from there we saw lines of tourists go up to the rock… and we didn’t want to go up there with all these people. When we told the personnel from the guesthouse that we didn’t like it, they proposed us to go to Pidurangala Rock, which is the smaller version of the Sigiriya rock next to it. Not only we saved a lot of money (entrance fee of the Sigiriya rock is almost 25 euros), we also got the most amazing view. We were up there alone and it was truly magical. This is a moment I will never forget. From here we also took the opportunity to go on a jeep safari at Minneriya National Park. During this safari we saw many elephant, and even we almost attacked by one, but we also saw crocodiles, beautiful birds, monkeys, buffalo’s and of course nature at it bests. Only 15 minutes from Sigiriya you will find the city Dambulla, where you can visit the golden temple and the rock temple. It has 5 caves and is certainly worth a visit. First you come across the Golden Buddha, which is pretty impressive because it is huge. The cave of Second New Temple: This is the newest cave of the one in Dambulla. And yes, there is also a nice view! We went to Nuwara Eliya by train and this was by far my best train ride ever! You’ll read it everywhere, but I can tell you that is truly the most beautiful train ride in the world. You’ll ride through tea plantations and jungles, you’ll get beautiful views and you can wave to the local people living along the track… it is magic! It is not the fastest way to get to Nuwara Eliya, but it is the prettiest way. Nuwara Eliya is a city that gets the nickname Little England, because it is founded by a British man during the colonial period in the 19th century and it is pretty cold and rainy here. When we arrived we just walked around the city and enjoyed the views there. The day after we arranged a tour with a local guy to visit a tea factory. During the drive to the factory we stopped at several places and viewpoint to take some nice pictures. We also stopped at a waterfall. Although it was pretty dangerous we went through the waterfall to go to a small pool of the waterfall to go for a swim. Be careful, because during the rainy season there are a lot of leeched. So make sure you check each other after a swim. At the factory, they explained us how tea is made and after the tour we got to taste a few different teas. Of course, we took some tea with us as a souvenir for our friends & family in Belgium. One of the favorite spots in Sri Lanka was Ella, a small village in the mountains. If you like it green, this is the place to be. We’ve done a homestay there with the sweetest family. They even thought us how to cook real Sri Lankan food. Here in Ella, just go for a walk in the scenery surroundings. Along the way you can come across tea plantations, tea factories, local people and walk next (or on) the train tracks. Our original plan was to go to the Adam’s peak, but because it was too cloudy that day, we couldn’t do it…. Adam’s Peak is a mountain in the central of Sri Lanka and is known for it’s 5.500 steps to the top. If you have the chance I would definitely climb this mountain during the night. The sunrise view must be amazing and it is the perfect place for a small pick nick. It is revered as a holy site for Buddhists, Hindus and some Muslims and Christians. Unfortunately we haven’t experience this, therefore we visited Ellas Little Adam’s Peak. We woke up in the middle of the night to climb the 1.141m mountain and takes around 2 hours to get to the top. Once on the top, the sunrise is absolutely magical and the views are breathtaking! After some magical days in the breathtaking nature in the center of Sri Lanka, we chose to go to the surf spot on the south east coast of country. It was also the first time we were confronted with the devastation the tsunami of 2004 left behind, which was heartbreaking to see. Because the last few days were exhausting, we wanted to take things a little bit easy here. Sunglasses, beach chair and a fresh coconut,… what do you want more? The next day we rented a tuktuk to cruise around in the neighborhood. We drove across some beautiful coastal paths, bought some of the delicious coconuts and ended up at a secret beach. It was a perfect relaxing afternoon. On our way to Unawatuna we decided to stop in Mirissa. We read online that it was a very nice, laid-back city, but we didn’t feel it… We felt like it was just the same as Arugam Bay. Although we didn’t really like it there, there are some tropical, white sand beaches and turquoise waters. So if you are in it for some beach-days, this might be a good place for it. We chose to stay at Unawatuna, which is a small beach city, because it was close to the city Galle. The city was the most important port city of Sri Lanka in the 17th and 18th century. The fort, built by the Dutch, is now on the list of World Heritage Sites and it is pretty impressive. You can walk on the wall around the fort, which gives you an amazing view of the fort and the sea. Galle has a very European vibe and is very different from every other city in the country. Narrow streets, unique artistic shops, great restaurants and bars,… there is a lot to see. You do not need to stay here for 5 days, because it is rather small. We stayed here for a longer time, as my best friend got very sick there. We were taking malaria-pills and she got almost every side effect you can get from the pills, so we decided to take it easy for a few days so she could recover a little bit. Induruwa is a small fishing village on the coastline for Sri Lanka. Perfect for some relaxing walks at the beautiful beaches and the lush jungles around the village. We watched a beautiful sunset there! The whole trip we stayed in very budget hotels without any sort of luxury. We spent our last night in a luxury 5-star hotel, which was awesome! So this was it… I’m so sad that Gilles has not experienced this trip with me. I did the trip when I just met him and we weren’t together yet. But in the future, I will bring hime definitely to the place that gave me the wanderlust. Hope you enjoyed reading about my fantastic trip in Sri Lanka. If you have any questions, please let us know, maybe we can help you!